Workman Publishing Company, 9780761138815, 600pp. Meg Cox was a reporter for The Wall Street Journal for seventeen years. She is the author of The Book of New Family Traditions and The Heart of a Family: Searching America for New Traditions. She is married, has one son, and lives in Princeton, New Jersey, where she belongs to the local quilting guild. Cox has been quilting for 20 years and is vice president of the nonprofit Alliance for American Quilts. 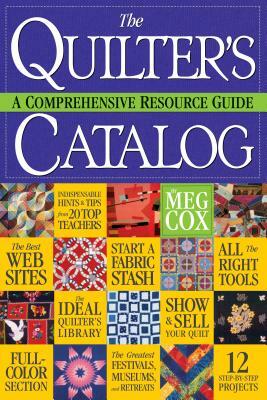 Meg sent me a copy of her book the other day, The Quilter's Catalog: A Comprehensive Resource Guide, and I'm here to tell you that it's absolutely, mind bogglingly, out of this world. The sheer volume of work that this former Wall Street Journal reporter put into this guide is astonishing and I defy any quilter (or non-quilter for that matter) to diss it. Along with more than several step-by-step projects, Meg goes into depth on the issues and products we want to know about – longarms, fabric dyeing, new vs. old techniques, up-to-the minute quilting tools, and interviews with the top quilting personalities known today (Well, not me but her book was written before we met. How's that for luck?). Honestly, if you have a quilt related question, it's answered in this book. Listen to this. The book's retail price is an astonishing $17.95 ( www.amazon.com is selling it for $12.21!) making it the very best value of any current quilt related book on the market today. How could you possibly pass it up? Kids, this is huge and I assure you that The Quilter's Catalog will be my bedside and sewing room reading for years to come!